Our traditions and culture is deeply rooted within ourselves and influences our personality and identity to quite an extent. Though each one of us gets all suited booted for our work voyage and slip into casual stuff for other events, a part of us surely knows that a desi hunk would always look his best in his traditional outfit. 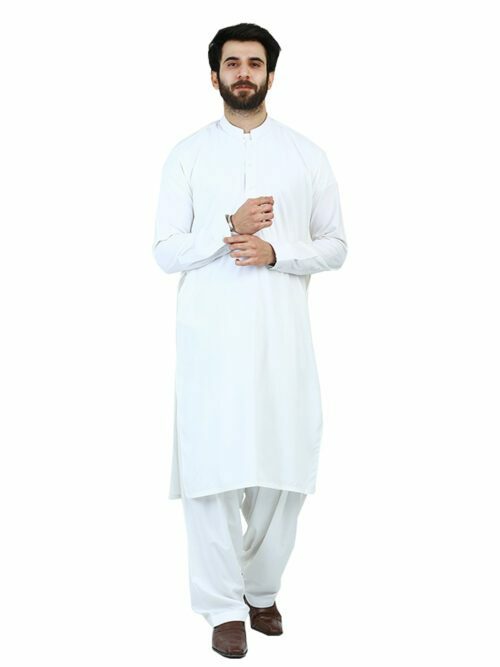 Shalwar kameez has always been the first choice of apparel for all men, especially at the time of eid, festivities, weddings, religious and family events as it gives not only a traditional vibe but also oozes the rawness, edginess and a different kind of enticing appeal which is why many individuals love to adorn and flaunt them. Moreover, this choice of apparel is so breathable and comfortable that it can be worn in all seasons and at all times without it being scratchy, pricky, abrasive or uncomfortable. ShahzebSaeed Pakistani Clothing makes you look extremely attractive and alluring. One commonly encountered misconception is that shalwar kameez is not as fashion-forward and stylish as other garments but these days the fusion shalwar kameez or extremely quirky and sassy ones with eye-catching hues and undertones will definitely fade rather erase these doubts and delusions. Everyone who loves wearing shalwar kameez is aware of the price that comes with it, as it is simply a rarity to find a stylish, fashionable, durable yet comfortable shalwar kameez that too in a range that doesn’t cost you a part of your body. Shahzeb Saeed is the brand which is synonymous with affordable yet stylish and trendy fashion. Hence we live up to our name and offer such shalwar kameez which will be not less than a steal for you. Our inventory has the huge, most massive collection of shalwar kameez mens; which are curated keeping in mind difference choices and preferences of masses and the latest trend and vogue. One thing that we assure you is that once you start exploring our range of shalwar kameez designs for men, you will be astonished by the variety and trends that we offer as it caters needs and demands of almost everyone. The fabric quality and stitching of Shalwar Kameez is of supreme quality and merely won’t last until a few washes, it might probably outlive you. The styles and designing of our shalwar kameez reserve the traditional essence yet have the modernistic, contemporary touch to it, Moreover, the colours are vibrant, quirky, unique yet elegant and classic which will enhance your persona rather than drowning it. The class and elegance of Shahzeb Saeed shalwar kameez will speak for itself and make people go green with envy once you adorn it. All these features that too in a price that will flexibly fit within your budget, definitely its unfathomable to digest but it’s a fact. Flaunt and parade your ethnic and traditional self with extremely vibrant, classy, elegant yet affordable shalwar kameez. Eids, festivities and occasions won’t be a hassle anymore because you don’t need to explore markets and shops, you have your one-stop destination for all your traditional wear. These shalwar kameez are a perfect symphony of ethnicity, elegance, class and contemporary fashion and trust us when we say this that you won’t regret a penny after splurging on them. A desi hunk will look his best in a crisp, classic and cuffed shalwar kameez so without any further ado unleash your traditional side with our happening apparels.